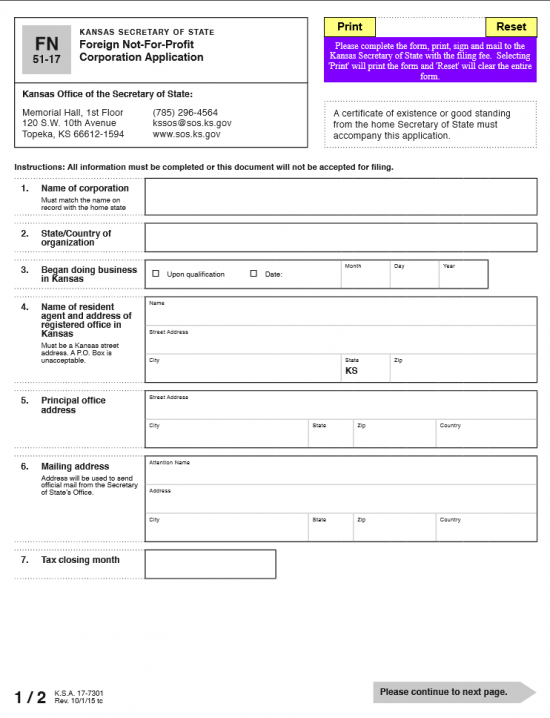 The Kansas Foreign Not-For-Profit Corporation Application | Form 51-17 should be filled out then sent to the Kansas Secretary of State. This begins the process of gaining approval to operate as a nonprofit corporation in the State of Kansas. This application should be submitted with a Certificate of Good Standing, or a Certificate of Existence, issued from the origin state of the applying entity. This must be dated within ninety days of the Submission Date. The original application, Certificate of Existence (or Good Standing), and full payment of the $115.00 filing fee will need to be submitted with any supporting documents by mail to Secretary of State, Memorial Hall 1st Floor, 120 S.W. 10th Avenue, Topeka KS 66612-1594. The filing fee is payable by check or money order and should be made out to Secretary of State. Step 1 - Download the Kansas Foreign Not-For-Profit Corporation Application here: FN 51-17. Once downloaded, you may use a PDF program to enter information, or you may print it then type in the required information in the appropriate spaces. Step 2 - In Article 1, “Name of Corporation,” report the Full True Name of the Corporation as it appears on record in the origin state of the foreign entity. Step 3 - In Article 2, “State/Country of organization,” report the domicile state whose jurisdiction may hold the foreign non profit corporation answerable to its laws. Step 4 - In Article 3, “Began doing business in Kansas,” indicate if the corporation will start transacting business once the articles have been submitted successfully by selecting the box labeled “Upon qualification.” If the foreign entity has already begun to conduct business or will do so at a date different then the filing date, then check the box labeled “Date” and enter the starting Date in the Month, Day, and Year boxes. Step 5 - In Article 4, “Name of resident agent and address of registered office in Kansas,” enter the Full Name of the adult individual or business entity (other then the one filing or forming) that shall act as the Registered Agent for this entity. Kansas State will require the Registered Agent maintain a Physical Street Address within the State itself. Enter this address on the second and third row of this section. Step 6 - In Article 5, “Principal office address,” report the Principal Office Address of the corporation applying for the authority to transact business in the State of Kansas. Enter the “Street Address” in the first row. Then enter the City, State, Zip, and Country in the second row. Step 7 - In Article 6, “Mailing address,” enter the Mailing Address the Kansas Secretary of State may use for official communications with the filing entity. Do this by entering the Contact Name of the individual on the line labeled “Attention name.” Then enter the Building Number, Street, and Suite Number used in the Mailing Address on the second row. Then on the third row, enter the City, State, Zip Code, and Country in the spaces provided. Step 8 - In Article 7, “Tax Closing Month,” document the filing entity’s Tax closing month. Step 10 - Article 8, “Full nature and character of the business to be conducted in Kansas,” must have the purpose of the corporation written out. It is generally recommended to be specific when reporting on why this corporation is applying for the authority to do business in this State. This should also include a report on how it will operate as a nonprofit in Kansas. Step 11 – Pay attention to Article 9 and Article 10, these articles will bind the foreign nonprofit corporation to Kansas State Law and limit the operation to not-for-profit corporation activities as defined by the State Law of Kansas. Step 12 - Article 11 is the next section to require attention. Here, check the box labeled “Perpetual,” if there is no specific date named for this corporation to cease its activity and/or cease to be. If there is a specific date for the dissolution of this entity, then check the box labeled “Date corporation will cease” then enter the Month, Day, and Year of this Termination Date in the boxes provided. Step 13 - In Article 12, “Effective Date,” define the exact Date this foreign not-for-profit corporation will begin to operate as such in this state. If the start date of activity is designated to successfully filing this application then mark the box labeled “Upon filing.” If there is a specific date this corporation will begin its activities in the State of Kansas, then mark the box labeled “Future effective date” and enter the Month, Day, and Year this corporation shall start to conduct business in the spaces provided. Step 14 - In Article 13, the foreign not-for-profit corporation’s Officer authorized to submit these articles must sign his/her Name in the box labeled “Signature of Authorized Officer.” The Authorized Officer must also provide the Month, Day, and Year.